On May 20, 2003 at 09:59 hours, Station 18 was dispatched to assist Nicholson FD (Wyoming County) for a working structure fire on Route 407. From Station 18 on the box were E-18, L-18, and T-18. Nicholson 1 (Herron) arrived on scene and reported a fully involved two story residence and advised Chief 18-3 (Seman) the fire was in Station 18’s first due area. Chief 18-3 requested a full first alarm assignment and special called for R-36 for a FAST duties. First alarm companies darkened the fire with tank water and began to establish a LDH supply approx 1500’ from the structure. Chief 18-1 (T. Turner) established 18 command on arrival and ordered a defensive operation with master streams. 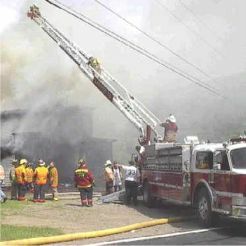 L-18 was positioned at the corners of side 1 and 2 for ladder pipe operations while E-18 operated its master stream fed from T-24. E-63 handled the scene water supply via 5” supply line. This was the first big shake down for E-63 since being placed into service and performed well. On the assignment: E-18, L-18, Nicholson engine and tanker, E-63, T-63, Ambulance 9, T-24, R-36, and Harford engine. Crews remained on scene with overhaul until approx 1330 and assisting PSP fire marshall. The cause is under investigation with no fire/rescue injuries reported.